It all began with a bit of hand-printing I noticed on the dinner menu at a local restaurant. I took a menu home for future reference. Several months later, some similar hand-lettering on another dinner menu caught my eye. I became a sort of connoisseur of menu lettering. After tweaking and adjusting a few of these menu-inspired (uppercase) characters, I placed them in an online Type in Progress survey. They won. So I finished the caps, drew out the lower cases from scratch, created a range of weights and oblique styles. 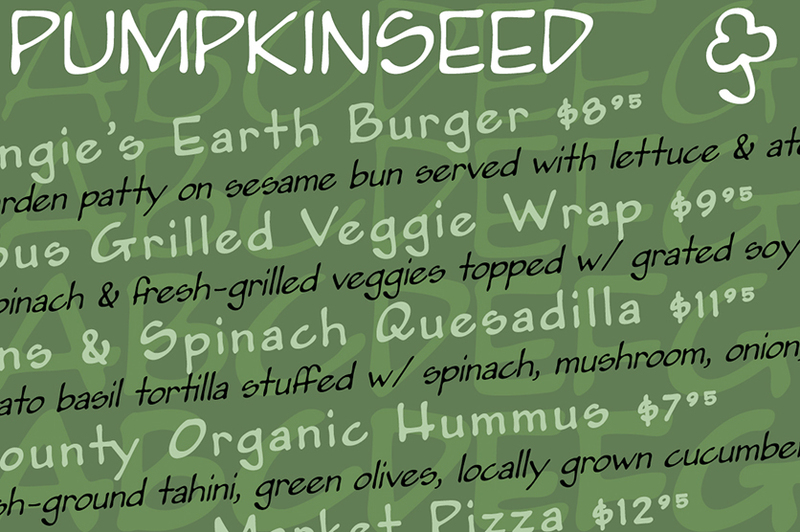 The result: Pumpkinseed, a full-featured, eight-style casual handlettering face. The OpenType release adds true small caps, old-style and lining figures, numerous ligatures, and Eastern and Central European alphabetsmore than 650 characters in all. US$89.